It was quite hot today. OK, OK, I’m not complaining. I was out and about a bit – under that warm Montreal sky and I saw a couple of interesting sculptures. SInce even as I write, “that” game is taking place I thought the first picture was a nice one to post, That rather grim guy on the steps of the Montreal Museum of Fine Arts is on of the Burghers of Calais (not burgers, you philistines) – you know, a sort of town councilor. You can see he’s holding the keys to the city. You can just look up the story on Wikipedia. Anyway, you can also see a nice Canadiens’ flag taped to his hand. I was surprised and touched that it stayed up there. 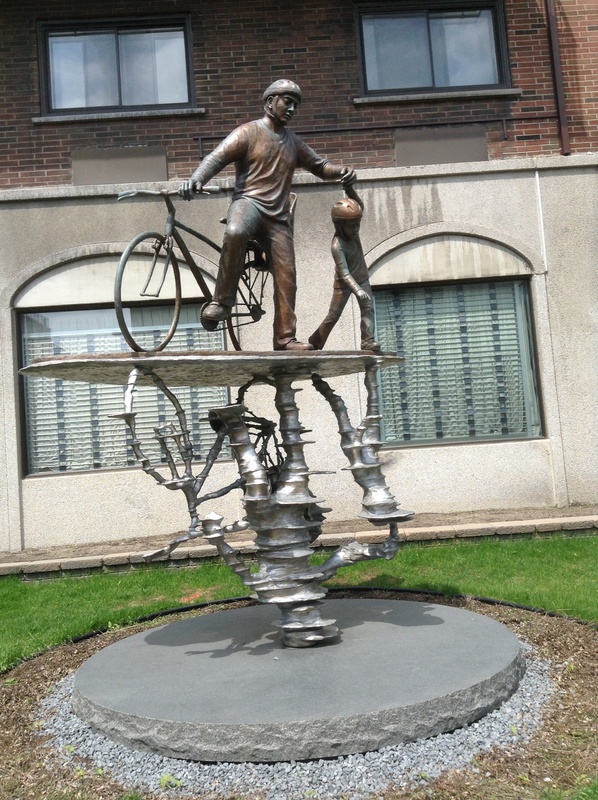 The second sculpture is close to the corner of St. Denis and Sherbrooke where I go for my Pilates class. Believe me, I almost turned into a statue myself in that killer class. I love Pilates. It’s the only form of exercise I have been able to stick to. I think it’s because most of it is performed lying down. Anyway, I think this sculpture is very interesting in that the artists ( there are two – a brother and sister from Quebec City and darm, I have forgotten their names) have portrayed a father and son supposedly reflected in the water in the bottom half of the sculpture. That is quite an ambitious project, I think. I must say I think, in the main, they have pulled it off. Interesting what you see if you open your eyes around town. Off downstairs to watch the rest of the game. At one point I was outside and heard two great cheers from people in the neighborhood. It has been a little quiet lately. I wonder what that means. A demain, darlings.